Bath time 6.30 - 7pm as we like to let her have a splash around and some days she actually falls asleep when we dress her so we feed her milk and put her straight to bed. Otherwise when we are out of the bath between 7-7.30pm we dim the lights in the lounge give her dummy and we just sit on the sofa and she is usually laid out rather chilled out. When she starts rubbing her eyes hubby will take her in the bedroom with dimmed light and I make milk. When we are sat on the sofa we don't do anything around the house because it will grab her attention and wake her up instantly - we learnt from previously. She will either fall asleep whilst drinking milk or stay awake when we put her in cot. If she's awake we will pop her dummy back in and turn our Ewan The Sheep then turn the light out and shut the room door. She will roll around and fall asleep within 10-15 minutes, sometimes she may do a bit of baby talk. If she is teething and I know her gums are sore we apply a bit of Calpol teething gel after milk then put her down. We use to do books but we noticed she was more awake so we decided to leave that for now until she's a little older and do books before bath instead. We love using porridge oats (yes the stuff we eat) soaked in the bath along with *Baby Aveeno emollient wash. Nicole has a tiny bit of eczema on her hand and feet creases so we are using oats to help keep that area soft and Baby Aveeno is great for stopping those areas getting dry because the water is very hard around our area. We also use the Aveeno body cream after which has natural colloidal oatmeal which is great for moisturising skin prone to eczema for 24 hours. We generally apply this after every nappy change all over her arms / legs to prevent dryness and irritation caused by skin dehydration and it's SO good for extremely dry patches of skin. We also add a net in her bath so she can either lay down to relax or sit up and play. Before she could sit up she use to just lay on the net and just enjoyed us washing her! She's also keeps trying to hold onto the bath rail to lift herself up so we have covered the rail with this bath book to distract her...not sure how long this will last before she figures out the rail is underneath. Lastly the green turtlemeter to make sure the temperature is right. 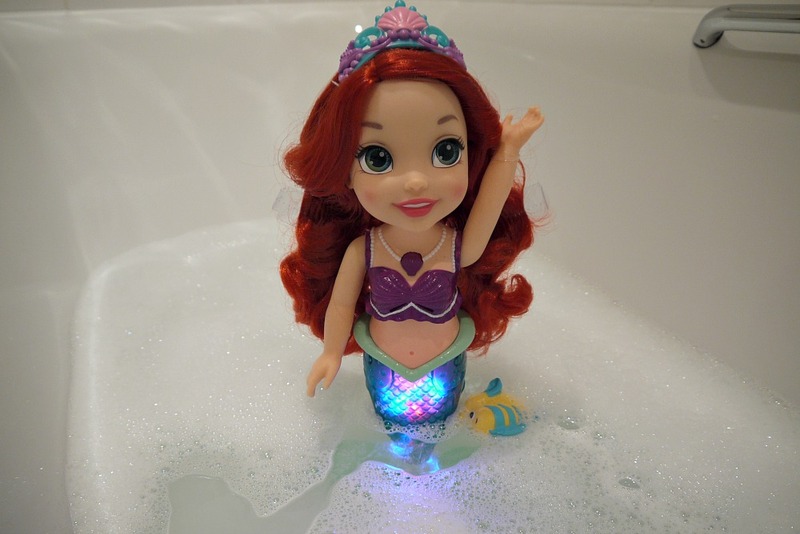 Since being able to sit up fairly well the last 2 weeks we will start putting her in the big bath and make bath time magical with *Disney Princess Colours of the Sea Ariel - isn't she beautiful and it brought back so many childhood memories. Colour of the Sea Ariel makes a great friend for bath time fun. Her magical tail that lights up giving a mini light show (see video above) when placed in the water and she will start singing "Part of your world" from The Little Mermaid. When she's not in the water you can also press her necklace for phrases from The Little Mermaid and the a shorter version of the song. Bath time just got a whole lot more exciting!!! !